Home About What is Nanoscience and Nanotechnology What is Nanoscale Technology? Nanoscale technology refers to our ability to utilize our understanding of nanoscale science to fabricate products with new properties and capabilities. To fully realize the possibilities, it becomes crucial to understand quantum interactions at the nanoscale; to be able to see nanoscale structures; and to be able to form, manipulate, and even connect nanostructures. Advanced imaging techniques allow us to image the nanoworld, and scientists are now beginning to fashion the tools we need to manipulate and engineer nanoscale structures. The semiconductor industry utilizes electron and optical lithography techniques to fabricate integrated circuits with billions of nanometer-size features on 8-inch silicon wafers (so-called “top-down” technology). Now scientists have learned to manipulate individual molecules or fabricate nanowires and connect them for information processing (so-called “bottom-up” technology). These technologies will have a dramatic effect on future advances in medicine, biology, and energy, as well as in materials science, semiconductor devices and computer technology. 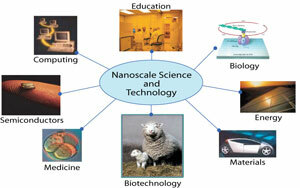 What is Nanoscale Science and Technology? | What is Nanoscale Science? | What is Nanoscale Technology? | What are Future Possibilities at UF?